*Drum roll*… the winner of our 2019 WIN a Kohler Generator is…. Congratulations, Stuart! 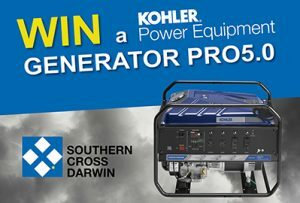 You have won a Kohler Generator Pro 5.0 valued at $1,625. Thank you to everyone who entered the draw. From the team at Southern Cross Darwin.